Over the last 20 years, I have sampled numerous Westlake loudspeakers, a speaker company that goes back to the 1970s with high-end studio monitors that are legendary. I even own a pair of LC8.1 and LC2.65 for the main speakers of my 5.1 reference system home theater room. But the new Tower series has raised my excitement level for Westlake. Definitely, the most attractive speaker line for home use (in the company’s vast offering of loudspeakers), this made-in-USA, high-dollar speaker is of the best that Glenn Phoenix has ever designed. The Tower 6 is equipped with premium SEAS drivers: a 1-inch soft dome tweeter and 4-inch midrange and two 6.5-inch bass drivers. With its duo of modest sized drivers, the Tower 6‘s factory rated frequency response is 38 Hz to 20 kKz, +/-3 dB. Power handling is 250 watts RMS. Sensitivity is 91 dB/1W/1meter. Impedance is 4 ohms nominal/2 ohms minimum. Always a fan of Glenn Phoenix and his many models of speakers, I believe the Tower 6 is an ideal, modern loudspeaker — tailor made for today’s more compact listening spaces, — and it is the best looking of all of his speakers. The Tower 6‘s dimensions are perfect for small-to-medium listening rooms, at 43-inches tall x 12-inches wide and 15-inches deep. They come in the standard satin black finish, or you can change finish by add-on, snap-set panels: walnut, maple or gloss black, which adds $7,000 to the cost. Pretty clever — offering finish options without having to build additional cabinets. Overall cabinet weight per speaker is a manageable 120 pounds, including the removable isolating base, which is key to its clean bass. Speaker hardware includes removable grills (better for listening when removed), and bi-wire terminals. The Tower 6 is based on Westlake’s legendary BBSM-6 studio monitors, still one of, if not the best, professional 3-way passive nearfield speakers ever built. The Tower 6‘s slender, oblique tower design allows them to work well in closer to boundary scenarios — without the bass loading up. In fact the Tower 6 have a refreshingly present tone, thanks to its bass accuracy in the 100-300 Hz region. Measured bass extend tightly to 40 Hz in my room, as measured with test tones and an RTA. The SEAS midrange/treble drivers also contribute to an expansive top-end impression that translates into energetic transients and detail that are not exaggerated, versus inferior speakers. All Westlake speakers have been updated with what designer Glenn Phoenix calls a “Low-PE distortion reduction design”; this patent-pending process is the result of Phoenix's research on a discovery that he calls PE distortion, or “Phoenix Effect.” Phoenix claims that PE distortion is unmeasurable by conventional testing procedures and contributes greatly to negative sonic artifacts, such as transient harshness and unnatural ambiance and tonality. This occurs even if the components are seemingly well matched, according to Phoenix. The Low PE distortion reduction technology consists of a unique termination system between all the signal -bearing components in the speaker. I powered the Tower 6's with several amplifiers in my home hi-fi system, including the old school McIntosh MC275 tube power amp, the Class-A MOSFET Pass Labs XA30.5, Class A/B MOSFET Pass Labs X350.5, pure bi-polar Class A/B from Bryston’s 14B SST II and Rogue Audio’s magnificent digital/tube hybrid Medussa. All the amps had little trouble driving the Tower 6’s, even the 1965 Mac MC 275, which I had to use stranded, smaller speaker cable to accommodate its strip termination. I used Alpha-Core solid-silver and solid-copper conductor speaker interconnects, as well as Westlake signature bi-wire cables, for the other amps. On the 24/352.8 (DXD) 2L Mozart Violin Concertos download, the SEAS tweeter and midrange delivered the violin’s complex tones and hues that are enhanced by this ultra-high sample rate original recordings. Source gear and preamps included an Oppo BDP-105, Mytek Stereo 192-DSD, TEAC UD-501 and Benchmark DAC2 D D/As, a Clear Audio turntable (using Rogue Audio Model 99 Magnum tube preamplifier), Coda high-current solid state preamp and a Pass Labs XP-10 preamp. Interconnects were all Wireworld. Power cables were courtesy of Essential Sound Product’s Essence Reference II’s heavy duty-audiophile cords and the accompanying Reference II power strip. I placed the speakers about six feet from the back wall of my listening room and eight feet apart, slightly toed in. As recommended by Westlake, I took off the front grills. Although the speakers had some factory “burn-in" time, I let them play with a “burn-in” CD of various music and tones — about three days. My first setup was the Westlakes via the Pass X350,5. Upon playing the Flim and The BB’S - Tricycle SACD, I immediately noticed how well the speaker translated the upper midrange and treble. 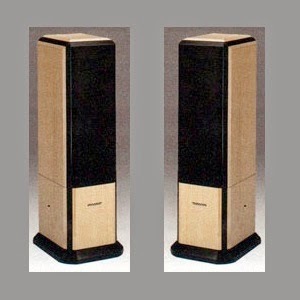 The presence of this speaker is more forward than other Westlake speakers I have used, including my Lc8.1s. It's a welcome attribute, especially in a room with a lot carpet, drapes, fabric couch, etc. The tonal spectra is not hyped; it's just that the top-end gets more focused and relayed out into the room. Drum cymbals horn solos and piano from the FATBB disc achieved a good dynamic balance from the hi-res version of the recording. Despite the narrow tower configuration, imaging is first rate with the Tower 6. On the Tuck and Patti - With Love, the vocal guitar duo gets a wide, deep detailed soundstage via the T6’s. Ditto for Anthony Wilson Trio - Our Gang SACD. On the 24/352.8 (DXD) 2L Mozart - Violin Concertos download, the SEAS tweeter and midrange delivered the violin’s complex tones and hues that are enhanced by this ultra-high sample rate original recordings. (Cost me $42 bucks.) Ditto with 2L’s Haydn/Bartok - Cello/Violin Duos, another DXD recording. The Tower 6‘s are great speakers for classical. Although it has two smaller 6.5-inch bass drivers, the Tower 6 does not skimp on the bass. In fact, it is my kind of bass. A tight, fast, bass response — without mid-bass bloom or bloat. I measured 42 Hz at the - 3 dB point in my room. Which is fine for most music in small-to-medium rooms. It won’t deliver the sub-30 Hz big driver bottom end in a large room, but the trade-off is worth it — to have a cleaner low end — in a room where the speaker may have to be mounted close to back or side walls. Although it has two smaller 6.5-inch bass drivers, the Tower 6 does not skimp on the bass. In fact, it is my kind of bass. A tight, fast bass response — without mid-bass bloom or bloat. I measured 42 Hz at the - 3 dB point in my room. As a three-way, I expected good vocal performance from the Tower 6, and it delivered. Diana Krall’s husky tones were nicely done by the Westlakes on the high-res Glad Rag Doll album. Jason Mraz’s “Everything Is Sound” from Love Is A Four Letter Word 24/96 download was another cut that showcased the T6's vocal range, very dynamic — without being too forward or edgy. Minimal sibilance as well. On classical choral works, Orff - Carmina Burana was rendered with precision, the choral vocals relayed all the multiple power this recording possesses but not overly aggressive. On pop music, the Tower 6's clean bass made it more articulate with densely track packed radio friendly music. Daft Punk's - Get Lucky tune, in 24/88.2 and dressed in its retro-funk disco persona, really kicked the 40 Hz and up bass from these speakers. But no bass bloating that I have heard from lesser speakers playing the same song. Bass-wise. the T6 handled almost any music I put through it, including some pretty good LPs, such as the original Telarc Fredrick Fennel Symphonic Winds from 1979. The Tower 6’s worked with all the amps I had on hand, including the MOSFET Pass, the bipolar Bryston, and the hybrid Rogue Audio. Even the old school Mac MC275 had no problem delivering through the T6s. The tight bass performance was a plus for the warm low-end of this vintage tube amp. I had no complaints about the Tower 6. They are expensive, but audiophile market forces manage to put a lot of hand-made, USA gear in the high-dollar bracket these days. These speakers are individually (and obsessively) tuned by President Glenn Phoenix himself, but he realizes the nearly $34,000 base price is not in everyone’s budget. Heavy bass fans may think the Tower 6 is bit lean, but I like the tight, accurate-delivery down to 40 Hz, and it makes it easy to place the speaker. To get deeper bass, Westlake also offers the Tower 12 (and two others in the series) — with similar midrange and treble drivers — but with with substantially more sub-40 bass. But they will cost you even more. Additionally, I am convinced that the Tower 6’s are a good choice for home cinema L-C-R, if you have the mounting location for the vertical center tower arrangement. Its accuracy and mid/treble projection should provide a phase coherency across the front. Heck, drop in two more Tower 6’s in the rear and a big powered sub, and you got a killer 5.1 system. Always a fan of Glenn Phoenix and has many models of speakers, I believe the Tower 6 is an ideal, modern loudspeaker — tailor made for today’s more compact listening spaces, — and it is the best looking of all of his speakers. Couple those attributes with the flat frequency response and a good throw by the modestly-sized cabinet/driver configuration, you got yourself a mighty fine sounding speaker. Yep, it costs a lot, but I have seen and heard some exotic speakers that cost way more and did not sound this good. Based on its performance, it receives a Stellar Sound Award.